iRobot has made available its latest robot-floor cleaning offering ‘Braava 390t’ in India. The feature-intensive device has been launched at a price point of Rs. 25,900 in India and can be purchased on Amazon, iRobot India’s website, and iRobot’s offline outlets. Let’s have a look at the device and the value that it adds to your life. Braava 390t is an ultramodern floor cleaner that features an ivory-colored, square-shaped robotic floor mopping device. Its unique design is further contrasted with a black, diamond-shaped glass that adds an exceptional depth to its visual appeal. Braava 390t starts its cleaning action without the need for any manual programming. The user-friendly device is controlled using three buttons, i.e. Start, Sweep, and Mop, and tirelessly mops up to 210 minutes covering about 1,000 sq. ft. in a single go. Braava 390t’s lean design further adds to its flexibility by enabling the device to cover unreachable regions, including under-bed and below-couch areas – resulting in immaculate overall cleaning. The whisper-quiet device comes loaded with a Pro-Clean System and dual-cleaning modes for dry and damp cleaning (sweeping and mopping). The device can also be filled with mild solutions or plain water and can easily work on hard surface floors such as vinyl, hardwood, and laminate. ü iAdapt 2.0 Navigation: It helps the bot to process over 60 decisions/sec and automatically analyze room contours to avoid rugs as well as other sites of possible encounter such as walls and drop-off zones such as stairs and raised transitions. ü Northstar Navigation Cube: The device has also been backed by Northstar Navigation Cube that serves as its localized positioning system (or an in-house GPS). ü Advanced Sensors: The mopping robot leverages advanced sensors that assist the Braava 390t in navigation and cleaning. Its in-built cliff detection sensors help in preventing the robot from falling down from drop-off zones. ü Pro-clean Reservoir Pad: Pro-Clean Reservoir Pad dispenses liquid in a phased manner as Braava mops. This keeps the cleaning cloth wet longer and enables more effective mopping. ü Fast-charging capabilities: Braava 390t can be charged in 2 hours through its Turbo Charging Cradle. ü Extended coverage – Braava 390t can sweep up to 1,000 square feet using a single-pass cleaning motion and mop up to 350 square feet through a triple-pass cleaning motion – which essentially uses a zig-zag action to mop the floor surface. In India, Braava 390t is backed with a 2-year warranty (for the bot) and 1-year warranty on the battery. 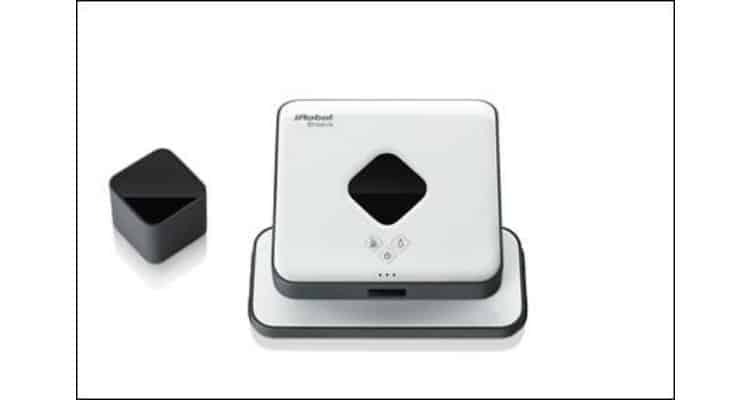 The iRobot Braava 390t can be purchased from the offline stores of iRobot across Bengaluru and Chennai, or from the website. Braava 390t is also available on the e-commerce website Amazon.in. iRobot Launches Braava 390t 0 out of 5 based on 0 ratings. 0 user reviews.